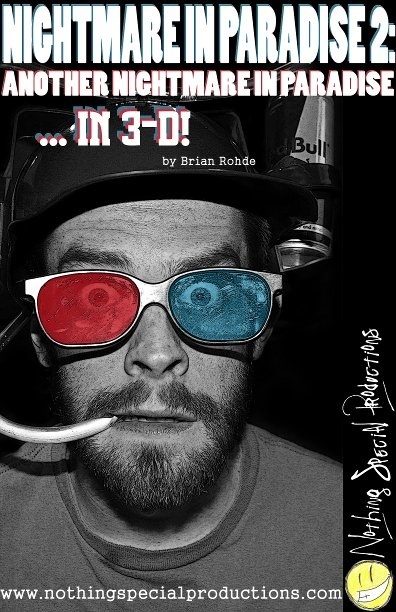 Competing for the longest title in the silly Halloween play category is Nothing Special Productions, with their wacky spoof play, Nightmare in Paradise 2: Another Nightmare in Paradise…in 3-D!, written and directed by Brian Rohde. Here’s the plot (generously lifted from their website): Dennis (Toph Enany) and Christine (Jenn Danielle Miller) have just returned home from a rather poorly planned honeymoon. Taking action for his mistake, Dennis tries to make amends by bringing his new wife to Hawaii for a second honeymoon. Upon arrival they meet a mysterious Bellhop (Scott Sawa) who, after drugging them to sleep, traps them in his nightmare kingdom where the only way to stay alive, is to stay awake…while dreaming…or they’ll be fed to the Bellhop’s singing midgetaur, Lonnie (Jason Grimm). Sounds ridiculous? Well of course it is. And entirely delightful. Rhode has set the tone just right: fast-paced, lighthearted, irreverent with just the right touch of camp. There are also a few jaunty musical numbers, written by Brian “Butterscotch” Blankenship and performed by Grimm (of performance group Smith and Grimm) as the singing midetaur, sporting a costume design you’ll have to see to believe. The infectious energy starts to dissipate near the end as the plot veers off track to meet the hasty conclusion, but that’s just a minor gripe. So, Nothing Special Productions has demonstrated their ability to reinvent Shakespeare, tackle a tricky black parable comedy, and now, pull off some Halloween camp. Pretty soon, they’ll have to change their name to Kinda Special Productions. Performances run tonight and just one more weekend in the second floor of Trace Bar in Wrigleyville, and it’s prefect pre-bar entertainment — the show’s over by 8 p.m., and you’ll have started your night off with a laugh.